Red kites are well known to be a social and gregarious species. 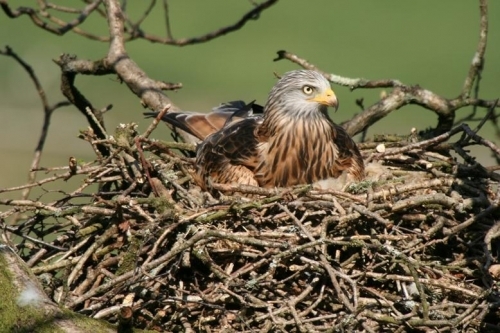 Even during the breeding season the red kite does not exhibit strong territorial behaviour and only defends a small exclusive territory around its nest site. While social behaviour in birds of prey is not the norm, it is exhibited in other species. This is seen in the winter gatherings of hen harriers and colonial nesting of birds of prey such as vultures. The social aspect of the red kite is best exhibited during the winter when large numbers of them gather together to roost at night in a particular forest or copse of trees. Communal kite roosting is a behaviour witnessed throughout the species range. During the winter, kites will choose a number of forests in a given area that they will roost in. The exact location of the roost may change day to day. The communal roosts start to build up from the late autumn but the tendency is strongest during the winter, particularly during the months of November to February. During these months, depending on the number of kites in the area, very large gatherings of kites may come together to roost. In the Chilterns area of England roosts of over two hundred kites have been seen, while in parts of Germany, a stronghold of the species in Europe, roosts containing over five hundred kites have been found. During the winter months when kites are roosting, individual birds will arrive at the roost from early afternoon on. Kites normally head to the roost shortly before dusk but some may do so any time during the afternoon. It has been presumed that the birds arriving earlier to the roost have been more successful in their hunting during the day, while those arriving late may have struggled to find food during the day and so must use the late afternoon to continue to feed. The kites generally arrive at the roost in a slow trickle, the numbers steadily building up before dusk. Early on in the afternoon the kites generally perch up in conspicuous locations, later on they move deeper into the forest to their final roosting spot. While kites of any age may be involved in a roost, the majority of birds at a given roost tend to be first and second year birds. Breeding kites may attend communal roosts but more frequently will roost in the wood where their nest is located. As the number of kites in a roost builds up the kites often engage in social activities that are generally described as play. These activities are also described as pre-roosting behaviour. On calm days the kites generally settle down fairly quickly into the roost, but on windy days will more readily engage in play. The play activities of the kites take a number of different forms. Mock fighting is common, with birds engaging in spectacular chases and dives at one another. Often during these aerial fights kites will come close to actually making contact with each other but rarely do so. Other forms of play include snatching branches and leaves from the trees or picking up items from the ground and repeatedly dropping and catching them mid-air. The play activities of kites at the roost can be viewed in a number of ways. Perhaps the birds are truly playing and engage in these activities to entertain themselves. The activities could also be viewed as a form of training. All the skills they practice during play will increase their chances of survival. Hunting is a natural instinct in the kite, but the skills necessary to do so effectively still need to be practised. Snatching small prey items from the ground is not a foolproof technique even for adult kites. Practising snatching leaves or small items from the ground may be beneficial in learning these techniques. Mock fighting helps kites develop flying techniques that will come in useful during hunting but also when trying to avoid the unwelcome attention of crows and other birds of prey. Large birds of prey, like kites, are often mobbed by crows and other raptors like sparrowhawks and buzzards. Learning how to get out of these confrontations is an important skill to a kite. While social activity like play can be an important part of the roost, as it is not always engaged in, it is thought that roosting communally has other benefits. A number of theories have been put forward to explain the benefits of communal roosting. Some species roost communally for protection. By gathering in large numbers the chance of any individual being predated are lessened. Also because a lot of birds are present, potential predators are more likely to be spotted and can be more easily driven off if necessary. This protective feature of communal roosting is probably more important for birds that roost on the ground, like hen harriers, or smaller non bird of prey species, like starlings. As kites roost high up in trees and have few predators the protection afforded by a communal roost is of lesser importance. It has been postulated/claimed that roosts act as â€œinformation centresâ€. Kites in a roost can see each other and those that have fed well are probably easily recognisable by their bulging crops. A kite that has not had much success in feeding could follow a well-fed kite the next morning when that kite may return to a carcass it had previously located. While this theory seems to have merit, when it was investigated by radio tracking kites leaving a roost, there was little evidence that this actually took place. In Spain, where this was investigated, it was found that carcasses the kites found generally only lasted a day and hence following a well-fed bird from a roost was unlikely to lead to a food source. This study suggested that the kites were employing an alternative food finding strategy that they termed â€œnetwork foragingâ€. The theory behind this is that by leaving the roost in a group if one individual finds a food source the other kites in the group can quickly converge on it. Often a food source, particularly a carcass will provide sufficient food for a number of kites. When foraging in a group if any individual finds food the group may share it, therefore the chance of any individual feeding are increased. This theory seems to fit in with the observed pattern of groups of birds leaving the roost together in the early morning. There are presumably other benefits to communal roosting. Selection of a mate may take place during the winter at these gatherings. For a long lived species, like the red kite, finding a mate is important and these large gatherings of birds may provide the perfect opportunity to choose a suitable partner. While the activities associated with roosting are presumably beneficial to individual kites, it is believed that the highly social nature of the kite, especially younger kites, limits the spread of the species. In common with many birds of prey, kites exhibit a high degree of natal philopatry, that is a desire to breed in the area they were hatched. This coupled with the highly social nature of the species means that red kites have poor powers of natural recolonisation. In Britain, where the red kite survived in Wales, up to 1989 there had been no record of Welsh kites breeding outside Wales. Because of this the likelihood/prospect of red kites colonising England or Scotland in the short term were low, hence the British red kite reintroduction programmes were started. The Irish reintroduction programme based in Wicklow will be complemented next year by a red kite reintroduction programme in Northern Ireland. Whatever the reason for the communal roosting behaviour of the red kite it is an integral part of the species ecology. Observing a kite roost offers the best opportunity to fully appreciate the social nature of this species. A pre-roosting flock of kites engaged in their play activities in the depths of winter is truly a wondrous natural spectacle.